You are afraid of being monitored by hidden miniature cameras? In this case you should always have this handy camera detector measuring only 50 x 65 x 15 mm with you, in order to control if you are not monitored by any camouflaged cameras in your hotel, home, office etc. 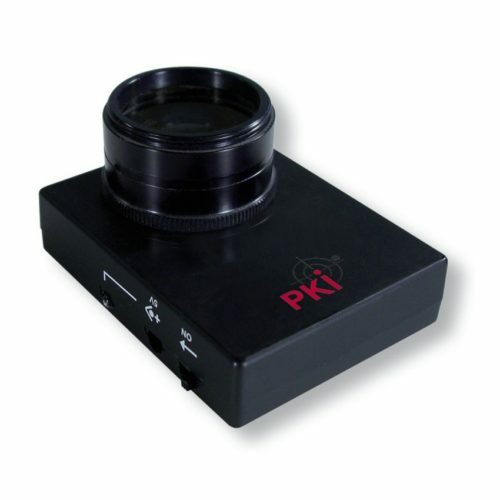 The PKI 4720 traces hidden cameras within some minutes. Just turn it on and scan the wall surfaces through the round hole. The detector emits a pulsating red LED-light. The pulsating frequency is adjustable from 1 to 5. If there is a camera hidden somewhere, the pulsating red light will be reflected by its lens, even if its dimension is not more than 1 mm, no matter if the camera is active or not. Protect your privacy by using the PKI 4720 for quick and easy control.